Our playground flooring innovation, SmartPlay, has been patented! We at PlaySmart are proud to share the news that our SmartPlay safety system has been patented for use in the UK and parts of Europe. SmartPlay is an exclusive playground flooring innovation that can be used alongside our EcoSmart and FireSmart grass mats to provide an enhanced safety surface. Initially, we created SmartPlay to improve safety when using rubber grass mats for fall height protection. The absorbent shock pads help to eliminate concerns about the safety of grass mats at ground conditions and weather. As well as providing that ‘added layer of safety’, SmartPlay also reduces maintenance and improves the look of a playground by stopping the grass mats from sinking whilst encouraging grass to grow. SmartPlay can be used for a range of applications alongside grass mats and can even help alleviate grass erosion problems. After all our hard work over recent years, I am excited to announce our newly awarded patent for the SmartPlay system. With the patent also extending to France, Germany, the Netherlands, Denmark, Italy, Switzerland, Ireland and Belgium, it gives us a foundation to, not only grow as a business, but to also create new opportunities to move PlaySmart’s safety surfacing into Europe. PlaySmart has always prided itself on its innovative and forward thinking approach to safety surfacing solutions and now with our exclusive UK and European patent we feel that SmartPlay will really help us cement our position as a leader in the UK playground market. For more information on our product range, why not take a look at our brand new product brochure? 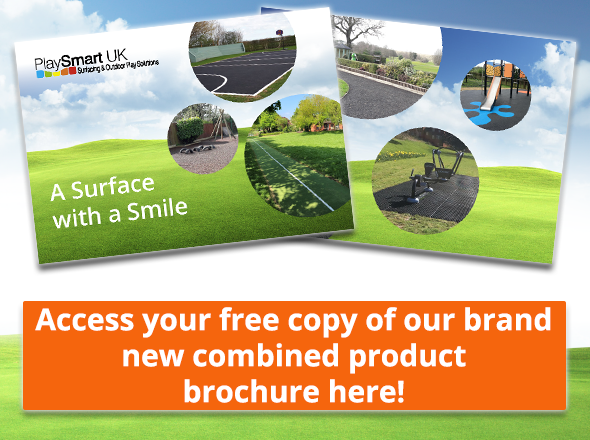 The brochure contains information about SmartPlay, as well as our full product range. To download, please click below.